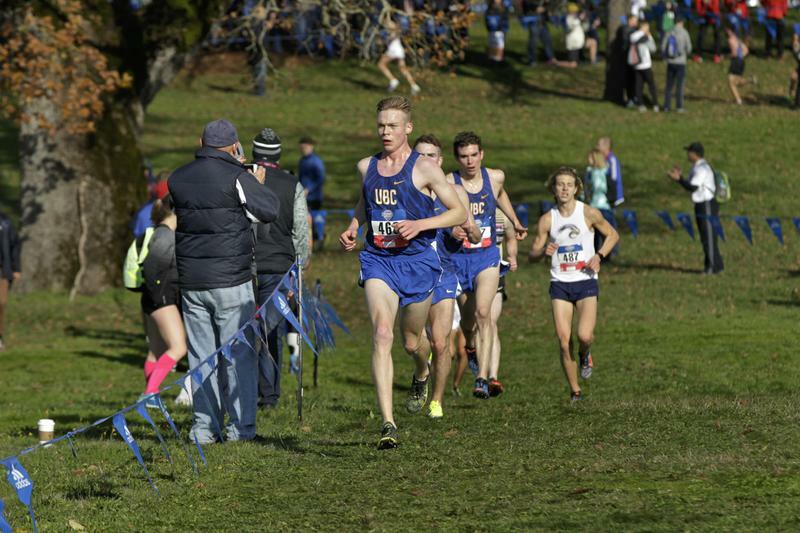 Following the trend of intimidating season results, the UBC cross country had another dominating weekend at the NAIA cross country championships in Vancouver, Washington this weekend — taking home gold in both the men's and women’s categories. “This victory means a lot to our team. We came in with the pressure of being ranked number one and wanting to redeem ourselves from last years championships,” Max Trummer, third-year member of the men’s team said in an email to The Ubyssey. Last season, the team went in to the event ranked number one and crossed the finish line initially under the impression they had placed first, only to find out they had won bronze. “We were so happy and elated, only to find out 10 minutes later that we were third,” Trummer said. This weekend, the team definitely made up for the previous year's disappointment. For the men’s side this year, all scoring runners placed in the top 20 at the event, with Kieran Lumb and John Gay finishing in the top five. 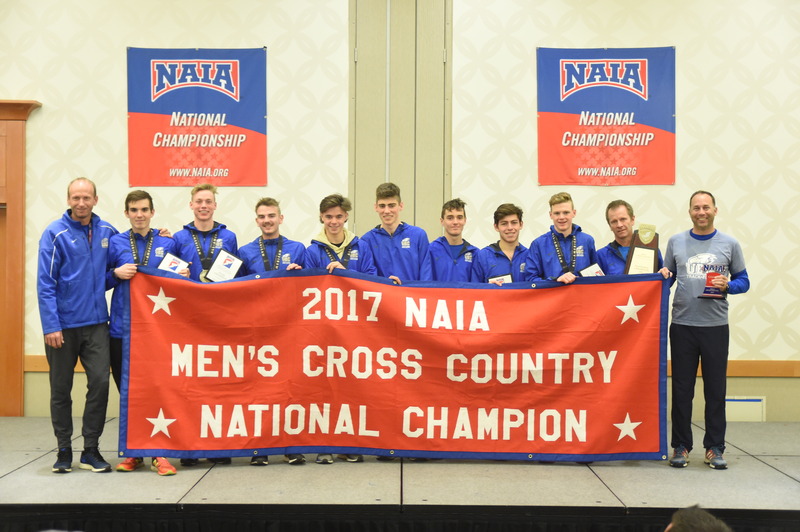 It’s the team’s first-ever NAIA banner, claimed with a huge 127 point spread between the team and their next closest opponent. UBC's final score of 41 is the meet’s best team result since the 1998 national meet. Of the other three scoring runners, Jesse Hooton finished in ninth place with a time of 24:50. Max Trummer and rookie Tyler Dozzi rounded out the group, with a 17th place finishing at 25:07 and a 19th place finish at 25:12 respectively. For Trummer, the range of ages in the team is an asset rather than a challenge. Overall, the men’s Thunderbird team ran the eight-kilometre race with a combined time of 2:04:17 —an average of 24:52 per runner. With the win, the Thunderbirds also become the only cross country team to hold both a U Sports and an NAIA title. The team already holds a U Sports banner from 1993. Men's cross country celebrate their NAIA win. Courtesy Kirby O'Connor/Referee Photo Inc.
On the women’s side, the team claimed its fifth national title in the last six seasons. 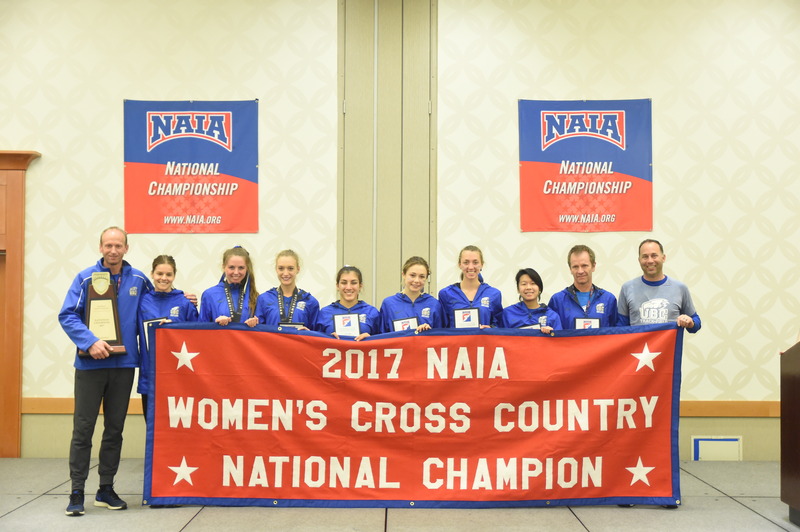 With the title, the Thunderbirds now hold the second-most team national titles in NAIA women’s cross country history. As a whole, they scored 109 points, edging out Texas university Wayland Baptist who finished with 125 points. Overall, the women ran their five-kilometre race with a combined time of 1:30:16 — an average of 18:04 per runner. Individually, Nicola Symonds finished in third place with a time of 17:26. Madelyn Brunt and Enid Au were close behind in 11th and 27th, with times of 17:53 and 18:09. Women's cross country with their NAIA banner. Courtesy Kirby O'Connor/Referee Photo Inc.
“In a team contest, every athlete has an important role and our runners executed perfectly today,” said UBC head coach Laurier Primeau of the meet. The men’s team has now won four of its six events this year, while the women sit just one title behind, winning three of their six events. This article has been updated to elaborate on the team scoring for the NAIA championship.